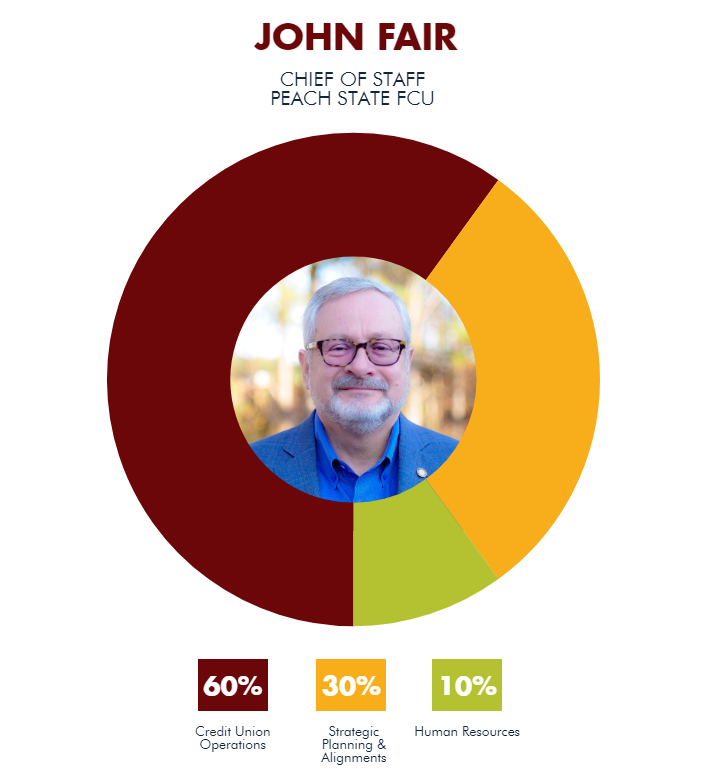 John Fair steps up as the second in command and touches everything from loan approvals to facilities management at Peach State FCU. A merger and two military careers have resulted in a title rarely seen in the credit union movement: chief of staff. When $64 million Southeast FCU merged into $359 million Peach State FCU on Dec. 1, 2017, the duo formed a member-owned cooperative that now serves more than 55,000 members and employs 177 FTEs. One of those employees is John Fair, a retired Air Force noncommissioned officer who had served as president and CEO of Southeast FCU since 2004. He’s now second in command at Peach State and reports to the president and CEO Marshall Boutwell, a former Army captain and Vietnam veteran. Here, Fair describes the genesis of his title and the duties of a chief of staff at Peach State FCU ($444.6M, Lawrenceville, GA). Talk more about the merger between Southeast and Peach State. John Fair retired in 1997 from the Air Force as a Command Chief Master Sergeant after 22 years of service. John Fair: During the due diligence process prior to the merger, we recognized that our histories and cultures were similar. Peach State was founded as a teachers’ credit union with a focus on education. Southeast also began as a single SEG sponsor. We evaluated all the benefits of our two organizations and determined the merger would benefit, first and foremost, our members as well as the communities we serve and our employees. Peach State’s focus remains on education, but we also serve manufacturers, city and county governments, and an array of small businesses. How did you land on “chief of staff” for your role at Peach State? JF: The concept for this position came about during our merger. Marshall Boutwell is the leader of our organization. He and I both have a military background. The title is a nod to our military histories and serves as a title of both respect and endearment. I report directly to Mr. Boutwell. I serve as Peach State’s second in command, and fellow executives seek my guidance. I welcome the breath of fresh air this position has given me. I find myself re-energized in this capacity and am grateful for this opportunity. Essentially, I coordinate the actions and activities of the other chiefs. JF: During my tenure at Southeast, I managed a successful credit union. Under my leadership, we grew to $64,271,665 in assets with 15.82% net worth. I firmly believe that education is critical in leadership roles. My military career includes education from the Noncommissioned Officer Leadership School at Dover Air Force Base in Delaware, the Noncommissioned Officer Academy at Tyndall Air Force Base in Florida, and the Senior Noncommissioned Officer Academy at Maxwell Air Force Base in Alabama. I have an associate's degree from the Community College of the Air Force, a bachelor’s degree from Southern Illinois University, and a master’s degree from Embry-Riddle Aeronautical University in Florida. JF: My areas of responsibility encompass all aspects of the credit union’s operations and its management. Essentially, I coordinate the actions and activities of the other chiefs. Being an executive leader for the organization, I must be able to adapt and overcome all situations that present themselves. I am fortunate to have an opportunity to work with a great team, especially under Mr. Boutwell’s tutelage and mentorship. JF: My day starts early with an hour drive to the office. I reside in Demorest, GA, and travel to Lawrenceville, GA. My days can include anything from loan approvals to personnel matters to expansions and facilities management. I worked closely with my team to implement a full Risk Management Department, which includes reviews of processes, policies, and procedures. We’ve also restructured the Member Solutions Department for efficiency, and we have revamped our Fresh Start Auto Program. I thoroughly enjoy the various challenges that this position entails and the variety of matters I encounter each and every day. JF: My philosophy is simple — you must be able to track and measure your performance. A goal can be neither set nor achieved if you cannot determine your starting and ending points. I currently oversee the performance matrix for various departments within our credit union. Each position is unique and varied; therefore, we must evaluate different metrics of performance. JF: I read trade publications, leadership books, periodicals, journals, and the good old-fashioned newspaper. I am a firm believer that you should never stop growing and learning. If I take away only one great idea, then the time I spent learning was worth it because knowledge is power. I also reach out to other leaders in the industry for their thoughts on topics. I recently attended the CUNA Governmental Affairs Conference where I met with colleagues and networked. The experience was invaluable to me both personally and professionally.